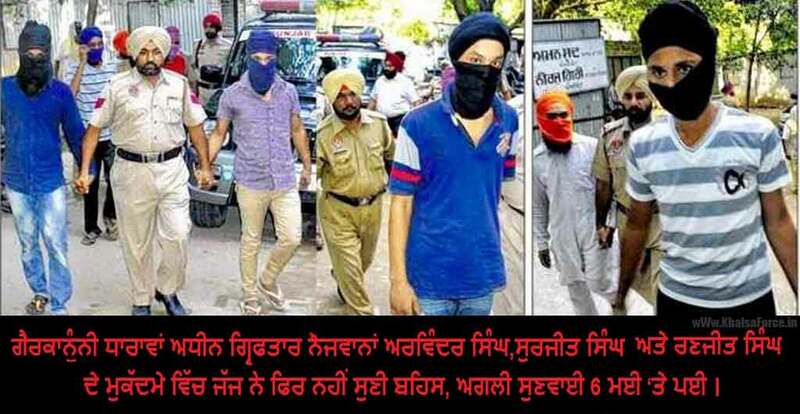 Arvinder Singh, Surjit Singh and Ranjit Singh arrested last year are not only facing Panjab police’s speciality of false and trumped up charges, but the added extra of an indifferent and partisan judiciary. One from dubai, Mitha Singh, a writer and his two friends were picked and charged with conspiracy against nation and unlawful activities, the Indian Govt 21st century TADA. There only ‘crime’ is that of participation in last year’s protests against the desecrations of Sri Guru Granth Sahib Ji Maharaj. With no recovery of any thing illegal or even innocently dangerous, the case is a text book example of Panjab’s high handed and tyrannical approach to Sikhs protesting the oppressive methods of governance and policing meted out to them. A prime example of a bias Judiciary was displayed when the judge refused to hear the oral legal argument of Rajvinder Bains, Sikh Relief senior counsel and High Court Lawyer and simply adjourned to a future date. The legal argument was then put in writing by the Sikh Relief legal team so that a record of the false case and its fallacy can be made. Submitted by Advocate Kukvinder Kaur so that it could be bought to the judges notice without any confusion as to what it declares, the judge has illegally and high handedly refused to accept this and stated that she will only accept verbal arguments. It is historical fact that in cases of Sikh political prisoners, when verbal arguments are taking place, the defence is saying one thing and the court stenographer is recording something quite different. This judge has shown quite clearly that the rule of law, of procedure and due process is in her discretion and that this case is not necessarily about truth and justice but more about her personal opinion and the suggestions of whoever is instructing her to behave illegally. Sikh Relief continues to support these Sikhs and hopes with Guru’s Kirpa truth and justice will out play lies and deceit.